Musings from Mount Helicon: Memory's Curse is coming along! 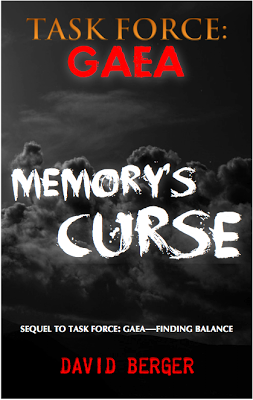 Memory's Curse is coming along! No, that's not the cover, not yet. I'll be conversing with Michael Hamlett who did the artwork for Finding Balance early in 2013 to do the cover again. His work truly inspires me! Art always inspires me, so I put this cover together simply so I could see what the end of the line could look like. And, inspire me it has. Over the past few weeks, I've been quite busy writing, and my process has changed since the last book. Now, I'm writing scenes that come into my head rather than sequential chapters (although some scenes are certainly sequential). As I see certain major moments unfold, I'll be filling in the gaps with more moments—some major, some not—and this novel will have a bit more character development of Dan, Aleta, Sarah, and Brandon than Finding Balance did. One of the reasons why is that this story is the true timeline. Without revealing what happened in Finding Balance, I can say that certain events unfolded differently, some very drastically, than the first story. What keeps certain events the same, linking them to the first novel, is how much of an emotional impact they had on characters. As you might have guessed, the idea of memory is the cornerstone to the plot. But, this is not why I wanted to write this post. I'm excited to say that I have now written 43,777 words (that translates into approx. 150 pages). I'm not putting and end limit on the story; it will write itself until I'm done. I imagine it will be a little longer than Finding Balance, but once the final edits happen, who knows. Currently, I'm on winter break, so I know I have more time allotted to me, but once school starts up again, I'll have to MAKE time to reach my anticipated, self-imposed deadline of spring 2013. No rush, though. I'd rather it be a little later and be better than rushing and it be not as good as it could be. Memory's Curse Book Blurb—Take ONE!